Why do you recommend, that I use OCHS herbal hair loss product for 3 consecutive months? Must I use it all 3 months? 1. Our research and clinical studies have shown, that maximum hair growth results have been achieved after using this for 3 consecutive months. Excellent hair growth was seen, even in our most difficult cases. 2. Hair growth rates vary depending on your overall health, age & length of your hair. Short hair grows fastest, approximately 3/4 of an inch per month. We, at Clayman Company refer to 3 months as a "cycle". Our regrowth formula has been formulated to add new strength and fullness to your hair with each new "cycle". 3. We provide a new way of thinking of your hair growth. With continued use, you will see added strength and fullness to your hair. Liquid or gel-caps, which is best? This is a choice by you the consumer. The liquid and the gelcaps are the same formula (100% Vegan). 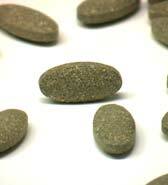 The recommended dosage of gelcaps is 2 per day - 1 soft gel capsule 2 times a day. With the liquid treatment, we recommend 3/4 of an eye-dropper (1 milliliter) taken with 4-8 ounces of non-alcoholic beverage (water or juice) 2 times a day. We also recommend takeing 4-8 ounces of non-alcoholic beverage with 3/4 of an eye-dropper (1 milliliter), because the liquid herbs can give a strong sensation to the sinuses. The hair loss formula is not diluted at all, just the sensation to the sinuses. It is up to you, we are trying to meet our customers' needs. Why take only 2 gel-caps? OCHS's herbal hair regrowth formula is an all natural nutritionally balanced supplement, blended to maintain nutritional levels for maximum hair growth. It is formulated to be taken daily. When taken as directed, results can be seen in 1-3 months, although some have reported positive results in as little as 3 weeks. Also because of individual metabolism rates results may vary within the before mentioned time frame. What is the problem with my dropper? Is it clogged? Natural products when extracted into a liquid form, use as much of the herb as possible in the process. The remaining herbs in suspension from the extraction process, may clog the dropper, but increase the efficacy of the product. We are working to make a plastic dropper available, which would solve this problem. Please close container tightly and shake liberally and or put the dropper in warm water to loosen the herbs. The liquid ingredients in this bottle look different from the previous bottle? Customers, who believe the ingredients in one bottle is different from another, need to be informed that natural products tend to have different appearances. For example, different shades of apples or berries happen all the time, but they are the same type of fruit an apple or berry. The finest herbs have been selected, extracted and formulated to maximize the potency and nutritional of this hair growth product.